Anthony Davis eludes tacklers, speeding around the corner toward the goal line. The Notre Dame linebacker gets the angle on Davis and meets him near the sideline. Hwump! It is the desperate defender's only big hit of the game, sending Davis full speed into the LA Times' photographer. The collision launches the thin woman in the tan pantsuit off her feet, impelling her ten feet back to the asphalt-and-rubber track where she lands in a heap. Her Nikon bounces along until it lands twenty feet to her right behind the End Zone. We photographers rush to the Nikon to see it has survived the hit. That moment comes back to me in a flash when I hear the distinct sound of lens bouncing against steel floor of Metro rolling stock. The abashed lensman remarks it is only a couple hundred dollars of Nikon lens. Now, if he'd dropped the $5000 D800 body, that would have been another story. Here’s what we would have missed. 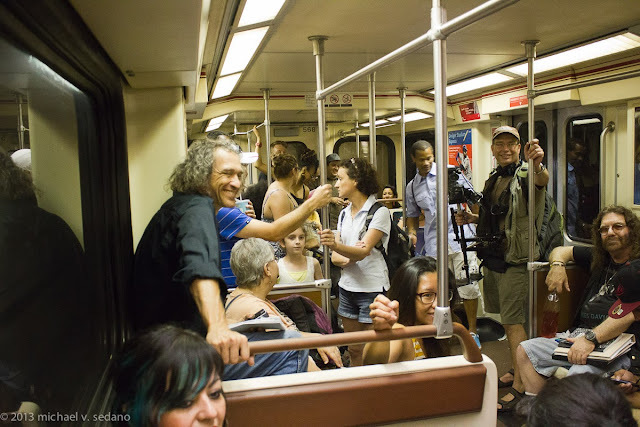 Riding the Red Line toward the heart of Hollywood is also another story for passengers finding themselves sharing space with the boisterous poets and photographers who fill one end of the 75 foot long subway car as it accelerates away from Union Station. Poesía para la gente went underground on June's final Sunday. Organizer Jessica Ceballos' inspiration for reading poetry in public spaces came to life with a passionate intensity embodying the conviction that poetry matters, that poetry belongs out in the open, not exclusively within the covers of chapbooks, loose-leaf binders, literary ephemera, and public readings attended by the other poets on the list. The event comes off magnificently! 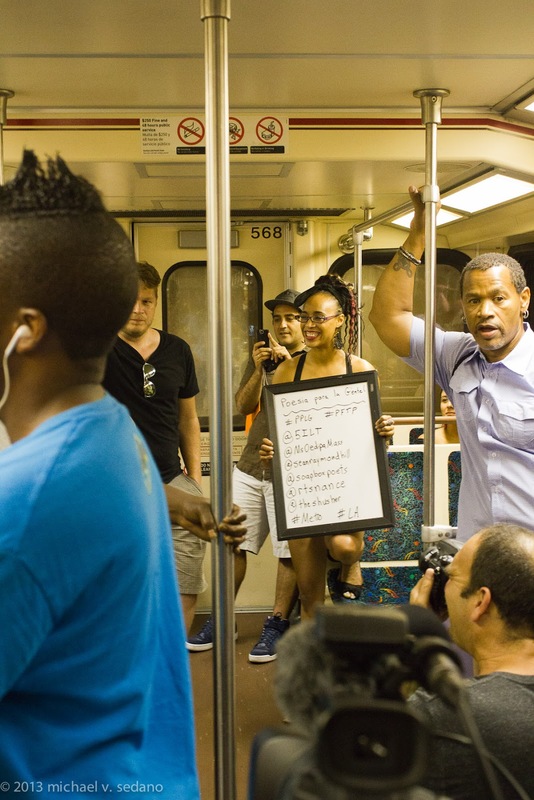 Jessica Ceballos and co-producer Ryan Nance issued their call for poets less than a month earlier and find themselves wrapped up in the energy and excitement that has some train riders looking on curiously. Some interact with poets, call-and-response, heckling, laughing, shaking their heads that gente would commit poetry in public places like this for all to see and hear. 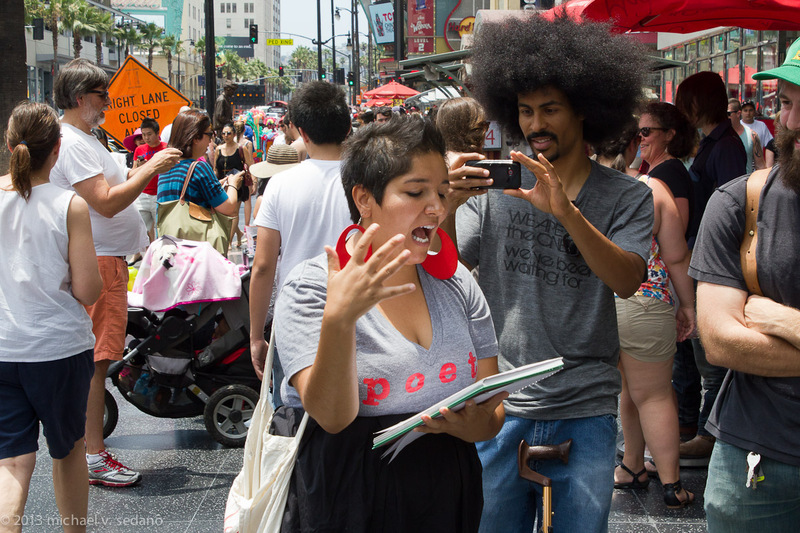 Poetry in public space is the raison d’être of Poesia para la gente, whose mission statement observes “…By providing a welcoming non-traditional, unique, and one-time-only public platform for sharing the power of the spoken word, we hope to stimulate intercultural understanding within the diverse population of the North East Los Angeles area...and beyond “. Conney Williams performs for the camera. 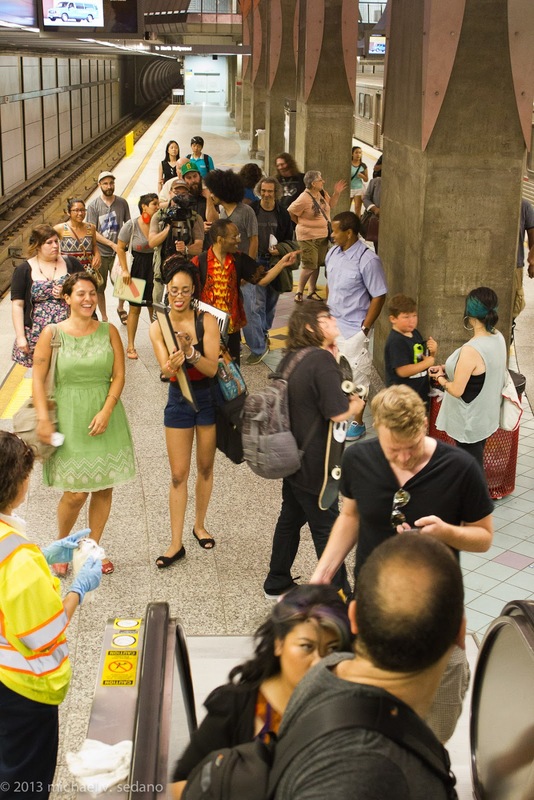 The poet crew comes with its own built-in diversity, an intercultural cross-section of the city of La, a mirror for the faces of passengers looking on, a spectacle for passing tourists when the itinerant poets, like Orpheuses ascending from the bowels of the MTA, become part of the frenetic scene at the corner of Hollywood and Highland. Cue Offenbach. Orpheuses ascending. One looks back. Jessica Ceballos in green dress realizes the event has taken on a life of its own. Arriving early, I stalk the Red Line platform thinking the event operating on CPT. The half hour interval between the announced gathering hour and the crowd trickling in allows me to quiz various gente. “Are you a poet?” I get alarm, quizzical looks, surprised denial. I explain to smiles of relief my motive in asking letting these strangers know that the brown vato with a camera means them no harm. “Yes,” the sole occupant of a manufactured granite bench affirms, asking if I know the organizers. I introduce myself and, suffering from chronic anomia, promptly forget her name. I quiz her about her work, what she’s chosen to share. She discloses she’s never read her work in public. I urge her let today be your day, and she nods agreement but I see the apprehension in her eyes. The reading starts with a shouted introduction. The first readers match their presentation to the setting; they fill their space, gesture with body and face and vocalics, and get the juices flowing. Kaya hangs back from the gaggle who crowd the readers, eager to laugh and cheer their comrades. Jeffrey Alan Rochlin reads as the crowd closes in. Kaya Amoroto makes a fist to relieve the pressure that builds as she prepares to do her first public reading. For one woman the change brought a once-in-a-lifetime change: she read in public for the first time. Now there’s no going back. But, as with any communication apprehensive person, taking that first step onto the stage comes gradually. I make eye contact with Kaya and signal with a head nod to take a spot. No, she smiles and steps back. I approach, offer my hand to lead her to the emcee. She doesn’t take it but walks with me and I introduce her to Jessica Ceballos. Personalizing the experience should infuse Kaya Amoroto with the confidence to get up there and read. Kaya appears more relaxed, integrates into the throng, but doesn’t claim an open mic. Kaya Amoroto stands and delivers. Kaya Amoroto holds on while taking command of her space. Ryan Nance, a co-organizer with Jessica Ceballos. 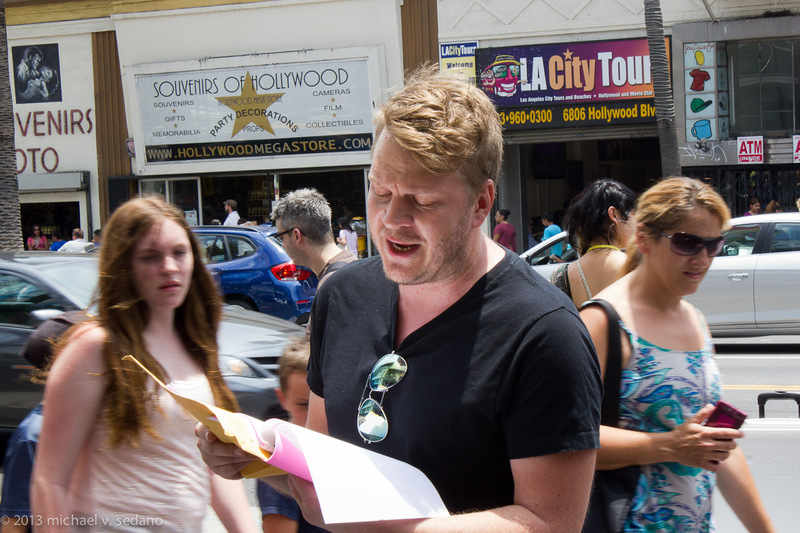 Tourists hitch a step when they see Ryan Nance making poetry happen in Hollywood. Karineh Mahdessian adds to the excitement of the walk of stars. 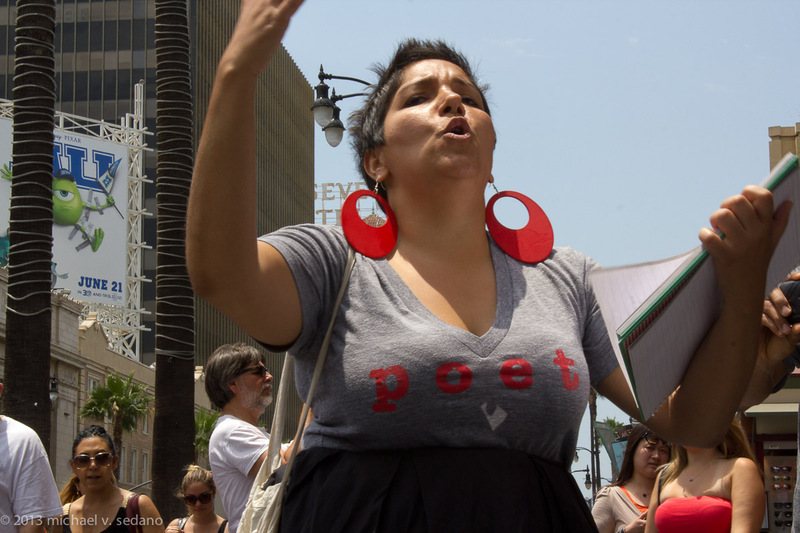 Karineh Mahdessian's tee shirt reads "poet". Indeed. But I didn’t see any of that. After Hollywood and Highland, I split. 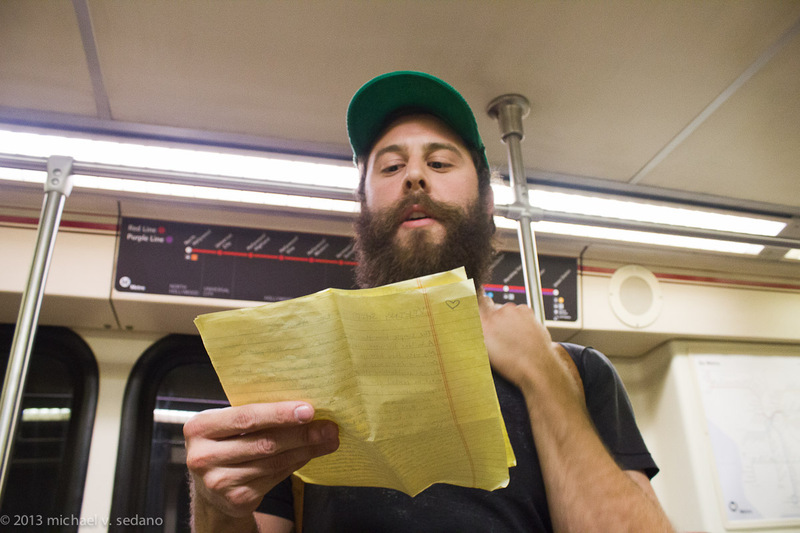 On the train back to Union Station I recognize one of the featured poets, Yago Cura. We platicar and chat, he introduces me to la esposa, Amanda, explaining they have to get back to the babysitter. I don’t take their foto we’re so engaged in our chaticar. 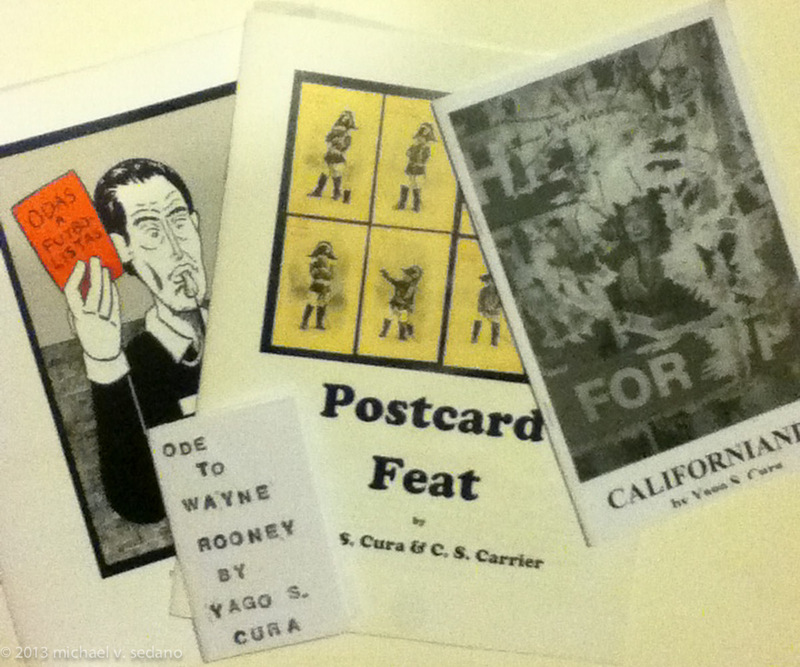 He pulls out a copy of “Postcard Feat” published in 2007 by Cura and C.S. Carrier. It’s an issue of Hinchas de Poesia, a beautiful color codex paying tribute to postcards, poetry, and the United States Post Office as a quintessentially Unitedstatesian institution, and the decline of mail versus the ascendancy of paperless thought. Yago S. Cura's Hinchas de Poesía and other ideas. Pobrecita la señora. She digs that Cura and I are enjoying ourselves so she doesn’t pull him off at their stop. 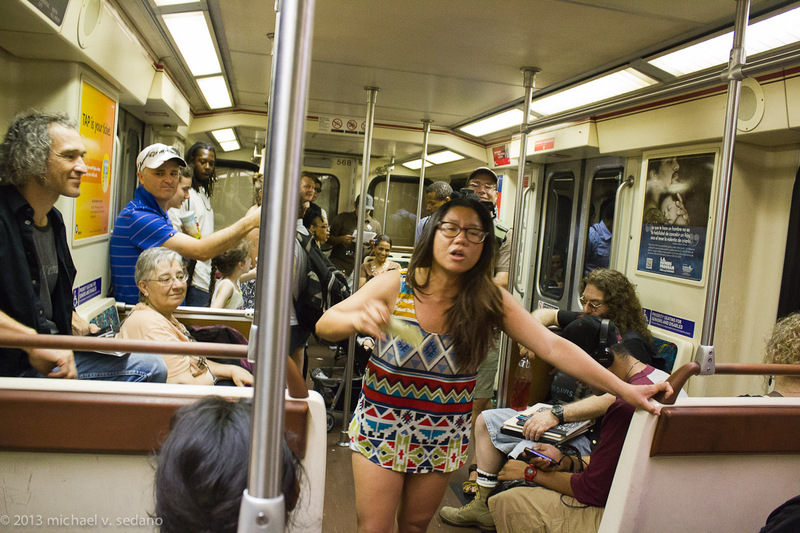 The couple miss their connection and now backtrack to another station to make the connecting ride home. Email Cura vai hinchasdepoesia.com for information on Hinchas de Poesia. 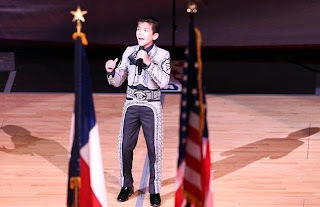 I did not know what the title meant, I thought of Ricardo Sánchez’ “Mis ojos hinchados,” but Yago explains an hincha is like a sports fanatic, except for poetry. Given where we had been, hinchas de poesia says in a nutshell what happened on the underground that day. 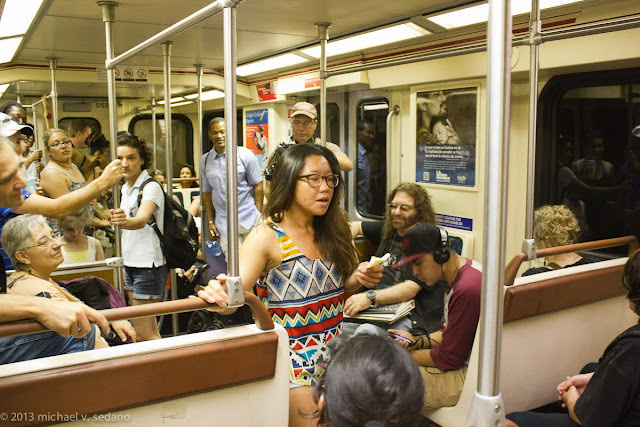 Poesia Para La Gente is a program of the Avenue 50 Studio's monthly La Palabra Poetry. The program has been made possible by a grant from The James Irvine Foundation. Ceballos already has plans in the works for the next Poesía para la gente poetry in public spaces event. La Bloga will share details when information arrives. 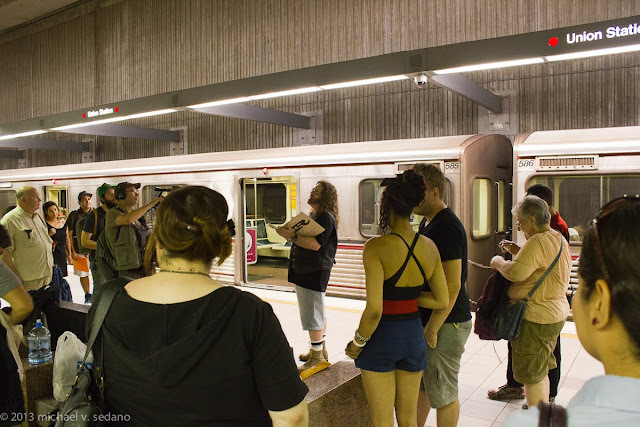 Jessica's Bluebird Reading Series has its next event Sunday, July 14, 2013, 2:00pm - 4:00pm at Avenue 50 Studio, Inc.
Back in November 2011, La Bloga published an epitaph for the Chicana Chicano precursor to today's fully burgeoned social media ambiente, Pocho2. Monday, wrapping up a seven year existence, Pocho2 formally closed its portal and disappeared into the ether. Hail and farewell, Pocho2. Pocho3 has sprung into existence as a still-embryonic Facebook group with a secret membership. Old Pochos from the original Cyber Cholo Chat Room, created by world-renowned cartoonist Lalo Alcaraz before he was famous, or Pocho2 hangers-on, looking to get into Pocho3, click here. 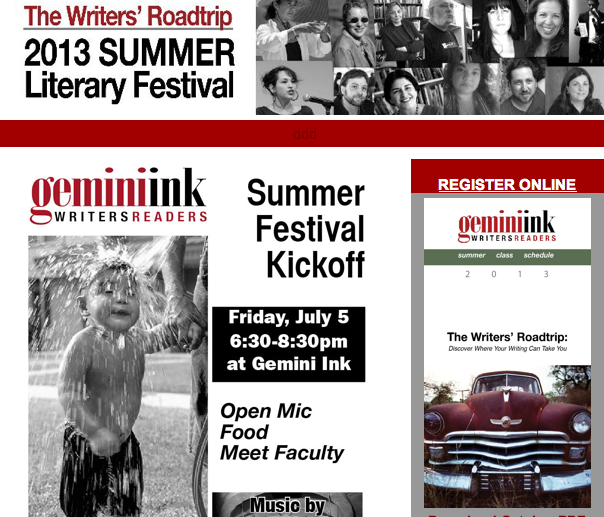 San Anto's leading literary cultural resource, Gemini Ink, plans a summer full of activities and learning. Visit their website for details on the kick-off event and the schedule of classes. What was in those bible thumbs? 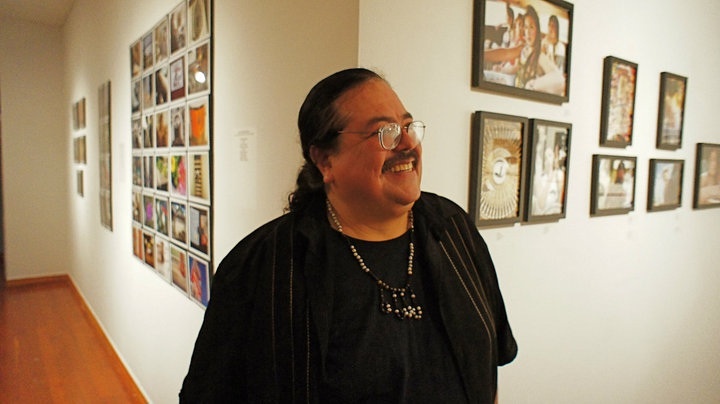 John Martinez studied Creative Writing at Fresno State University. 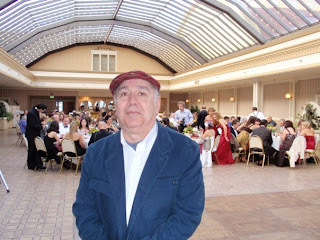 He has published poetry in El Tecolote, Red Trapeze and The LA Weekly. 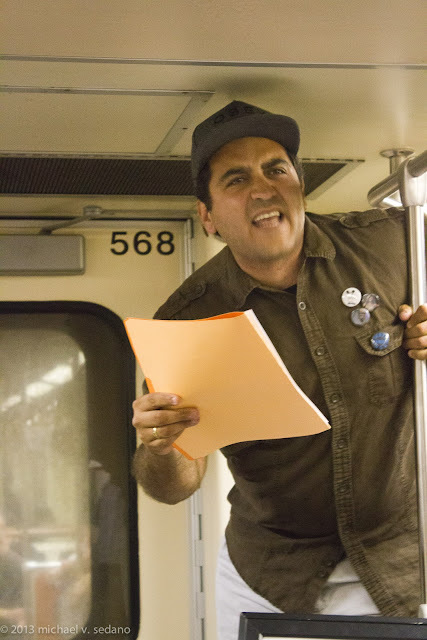 Recently, he has posted poems on Poets Responding to SB1070 and has published in La Bloga (an online Blog dedicated to Latino/Chicano Culture and Literature. 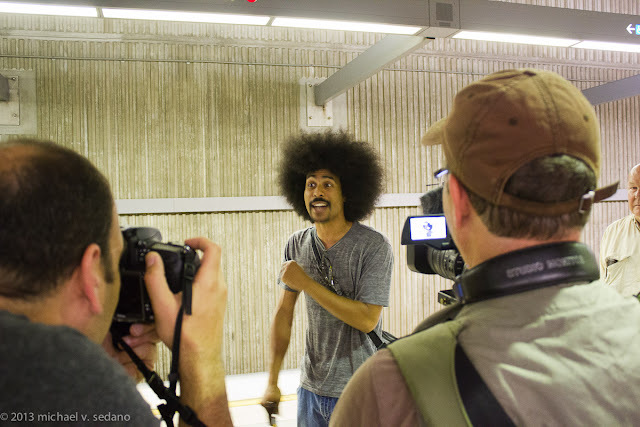 He has performed (as a musician/political activist, poet) with Teatro De La Tierra, Los Perros Del Pueblo and TROKA, a Poetry Ensemble (lead by poet Juan Felipe Herrera) and he has toured with several cumbia bands throughout the Central Valley and Los Angeles. For the last 17 years, he has worked as an Administrator for a Los Angeles Law Firm. He makes home in Upland, California with his beautiful wife, Rosa America y Familia. His first volume of Poetry, Under The Forgive Sky, is due out in August and will be available on Amazon. 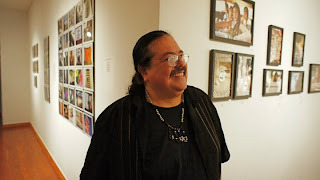 Francisco X. Alarcón, award winning Chicano poet and educator, born in Los Angeles, in 1954, is the author of twelve volumes of poetry, including, From the Other Side of Night: Selected and New Poems (University of Arizona Press 2002), and Snake Poems: An Aztec Invocation (Chronicle Books 1992), Sonetos a la locura y otras penas / Sonnets to Madness and Other Misfortunes (Creative Arts Book Company 2001), De amor oscuro / Of Dark Love (Moving Parts Press 1991, and 2001). His latest books are Ce•Uno•One: Poems for the New Sun/Poemas para el Nuevo Sol (Swan Scythe Press 2010), and for children, Animal Poems of the Iguazú/Animalario del Iguazú (Children’s Book Press 2008) which was selected as a Notable Book for a Global Society by the International Reading Association, and as an Américas Awards Commended Title by the Consortium of Latin American Studies Programs. 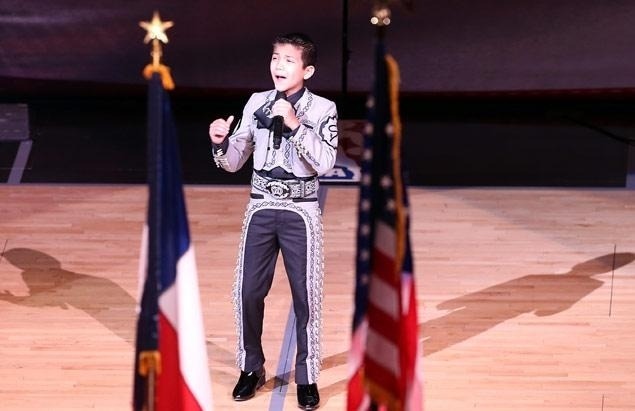 His previous bilingual book titled Poems to Dream Together/Poiemas para sonar juntos (Lee & Low Books 2005) was awarded the 2006 Jane Addams Honor Book Award. Alarcón teaches at the University of California, Davis, where he directs the Spanish for Native Speakers Program. He is the creator of the Facebook page POETS RESPONDING TO SB 1070.
at the door of divinity. Javier B. Pacheco was born in Palo Alto, CA, April 22, 1949. He is a S.F. Bay Area performance poet, pianist, composer, arranger, with an M.A. in Music (UCLA 1986) and PhD in Ethnomusicology (UCLA 1994). He is pianist for Broken English (Santa Cruz), directs his own ensemble, Orquesta Pacheco, and performs Jazz on occasion with the Pacheco Trio. Esmeralda Bernal resides in Phoenix, Arizona. 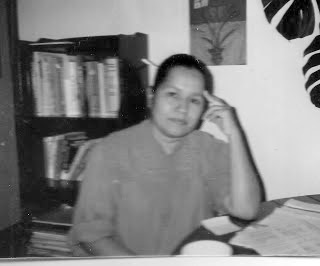 Her poetry has appeared in La Bloga, HaLapid, Yellow Medicine Review, Nahualliandoing Dos: An Anthology in Nahuatl, Espanol and English, and recently in the San Gabriel Quarterly Review: Issue 58/ Spring 2013.
but its only just begun. by oppression or by being driven you have crossed that line. the crossing from a team of many to a team of one. you will walk across as you aspired to do. are some awesome poets! :-) I am a little jealous that I missed our departure putting away my Schwinn...had to catch them at MacAuthor Park. It was worth it...I tell Ya. I enjoyed this experience and would recommend that other poets participate in an event like this. 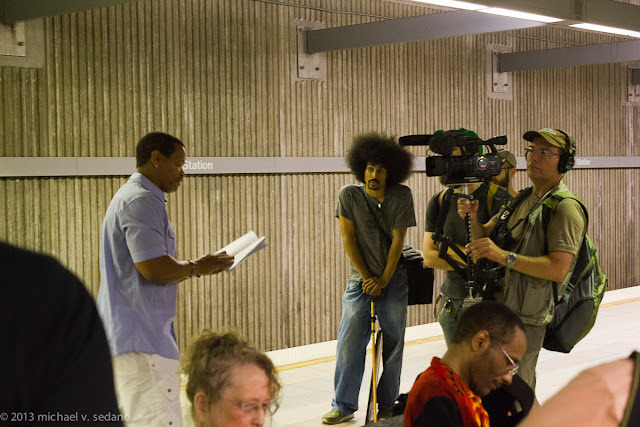 THE OUTSIDE COMMUNITY NEEDS TO SEE THIS POETRY IN MOTION.....CHANGING LIVES ALL AROUND US.